We had the opportunity to drive an unusual Hilux for the last week. The Toyota Hilux SR5 6 speed manual transmission isn’t a very common variant. Usually at that specification level the overwhelming numbers are automatic transmissions. We have tested the Hilux SR5 AT a number of times before and it was a finalist in the OzRoamer COTY awards. To say it is a good Ute is an understatement. Once the range topping version, there are now some special editions that sit better equipped and more specifically equipped such as the Rogue and the Rugged X.
Australia is one of the most competitive Ute markets in the world and demand for a better class of Ute has increased. We are seeing a shift upmarket and upsized as well with the likes of the RAM Trucks 1500 soon to be for sale. Which makes the SR5 6 Speed Manual even more unusual. Externally there is no difference between the MT and AT. The latest Hilux has a very distinctive grill and protruding nose. I actually like it but many don’t. The SR5, as you would expect, has plenty of external bling like LED headlights and daytime running lamps as standard, front fog lights, a sports bar in the tub, chrome radiator grille, chrome rear step and new 18-inch alloy wheels which are fitted with a new 265/60 R18 highway tyre that is designed to assist with fuel economy without compromising handling. Internally, apart from the obvious difference of transmission lever there is little difference. Our SR5 was fitted with the optional pack that included leather seats, which were well worth it. Front seats are heated and the driver’s seat is electronically adjustable and very comfortable. No extra lumbar support though. There is enough slide for even the tall drivers to sit and with the height and reach adjustable leather steering wheel, everyone can get comfortable. The dash has a two dial blue light style with a MFD between. Very clear and easy to use and read. The steering wheel frames the dash perfectly, some vehicles, when you drop the wheel, you lose the top of the dash from sight. The wheel itself feels great in your hands and houses the audio and MFD controls. Toyota has the slide out cup/bottle holders below the side vents, a brilliant idea copied from Isuzu. The select on the fly dial for the 2WD/4WD system is located just below and to the left of the steering wheel. This sits alongside the rear diff lock, downhill descent control and traction control switches. Just above are the A/C controls etc. Heavy duty rubber mats adorn the floor protecting the plush carpet underneath and increasing the practicality of the vehicle. Sitting proud on top of the centre stack is the 7 inch screen that houses Satellite Navigation, Toyota Link, audio system etc. It works well enough but Toyota keeps refusing to include Apple Car Play and Android/Auto and that is a pain for some drivers. Sometimes the touch screen is a little insensitive, requiring extra force for the touch. 2 12V accessory plugs, 220V accessory socket, USB input and silver interior highlights. 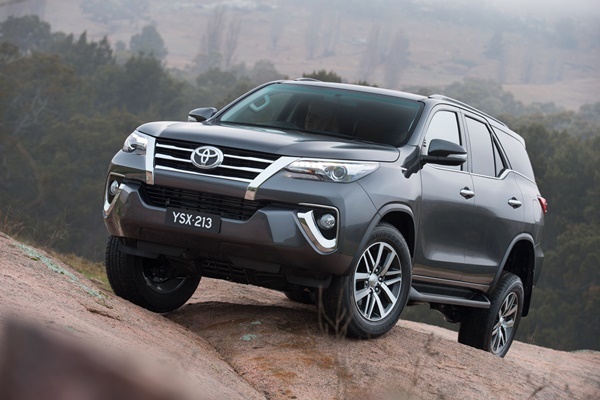 The MT and AT Hilux are both powered by a 2.8L high-torque turbo-diesel engine. The manual produces power of 130kW @ 3,400rpm and torque of 420Nm @ 1,400rpm. This translates directly to a more relaxed driving experience. While the 6Sp MT isn’t my first choice the ratios match perfectly to the engine and allow the maximum use of power and torque. First gear is very low and you find yourself quickly changing to second gear. You can cruise comfortably around town in 5th gear at 60 km/h, and 6th gear is more suited for 80 km/h plus. However there is reasonable acceleration in 6th gear as well and the Hilux will happily cruise well above the speed limit. We managed about 8.2L/100K over many hundreds of freeway driving and about 11.7L/100k around town. The Hilux allows the driver a choice between normal, economy and power for the transmission. These really do make a difference by recalibrating the match between gears and engine revs. The transmission is smooth and really easy to use. Overall the 6 Sp MT is amongst the better Ute transmissions. But I would still take the AT every day of the week, simply because it is much easier to drive for us lazy drivers. There really is no need to discuss the 4WD ability of the HiLux. It is superb. Again it always has been a good tow vehicle, but felt lacking at times. The torque and the low rpm delivery now means that towing with the Hilux gets a big tick. Unladen ground clearance is 279mm. Approach angle is 31 degrees, rampover is TBC and departure angle is 26 degrees. Kerb mass of 2075kg and Payload of 925kg. Towing capacity is 3500kg and tow ball rating is up to 300kg depending on reduction in GVM. Safety is an ever moving feature on cars and more importantly Utes. The Holden Colorado currently leads the regular pack with safety features, however the MB X Class and others such as the RAM 1500 etc are pushing the envelope even further. As a family run around the Hilux SR5 MT Dual Cab Ute is a little cramped in the rear for leg and knee room for teenagers etc. Having 4 adults is even more cramped. It does have isofix points. The issue here is that you need at least a tonneau cover or preferably hard lid for the luggage. It is longer than a SUV for shopping centres and doing the school run or soccer run it has more limited seating. As a work Ute, it really is more for the foreman or business owner. It will accommodate a reasonable payload, but the true trades’ person would probably opt for a single cab tray back. As a recreational 4WD vehicle the SR5 comes into its own. Its 4WD credentials are up there with the best, as is it towing capability and the tub back allows all manner of life style items, like scuba tanks, dirt bikes, etc to be transported with ease. However, the Hilux, as an all-round balanced vehicle fits the purpose better than most other Utes. The Toyota Hilux SR5 offers more SUV-like features including an improved compliant ride, quieter cabins and higher levels of comfort and convenience. The six speed manual transmission is very easy to use and smooth even around town in peak hour traffic. However just because its good, doesn’t mean I would pick it over the automatic transmission. The Toyota Hilux continues to be a premier 4WD Ute. Recent improvements have made it better and stronger. It is now better at towing and driving off road while cocooning the occupants in more comfort and style. To be honest I have never met a buyer that has regretted buying a Hilux.